Many preschool teachers and stay at home moms spend hours on making games and activities for preschoolers. When I make a game mat, I like to make it colorful, simple, self explanatory, and as open-ended as possible.. I like to laminate most of my game mats so they can be used over and over again. Sometimes, I like the game mats to be big so they can be played by one child or more than one child. I want to encourage some collaboration, problem solving, and creativity. With any game, I try to keep it out for several days. I find that often times the game will get passed over at first but eventually the children get curious and will give it a try. By the next day, the children will often come back for another go at the game only now they seem more confident or more engaged in the game in some way. I never know what the children will come up with but leaving it out for several days gives them more time to come up with new ideas for how they want to play the game. Where possible, I also like to add other manipulatives to use as game pieces or another way to keep the children engaged in the game. There are other times when I will make more than one game mat so the children can each have their own mat to play with. Almost every game mat has some type of learning objective. It may be counting, number recognition, letter recognition, sorting, or graphing. But regardless of my core objectives, many other types of learning take place when I just let the children play. There are times when I will explain my idea for the game with the children so to help them get started. In one recent game, the children just couldn’t get past fighting over their favorite color of frog. So I showed them how we can roll the dice to see which color of frog gets to go to the next square and we can all cheer for every frog and just see which one will get to the finish line first. Sometimes, the children like me to sit with them and play the game. Some times, the children like for me to just sit and watch them play the game. Other times, the children just want to play alone and make up their own rules for play. I often have to remind myself what the ultimate goal of playing any game should really be – and that is to not only give children the opportunity to learn a core concept but to also give them opportunities to build important life skills. Whether they are learning a core concept or how to follow rules, how to take turns, how to share, how to get along, and how to make up their own rules – there is value in the game-playing process. Click here to learn how to make this frog game! 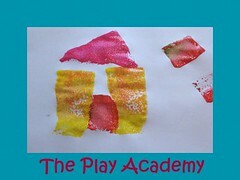 I am linking up with The Play Academy…. This is great! I love how you use different manipulatives and let the kids have freedom to figure out how they want to play it. Thanks for the great ideas! I love your photos and descriptions of how you create the game mats – and I love how you use them to teach life skills as well as educational concepts! Hi Deborah, thanks for sharing this with us at the Play Academy. As always your post is inspiring with lots to think about. I think one of the most important aspects of playing a board game is to learn the social side of things. We often choose a very, very simple game really as an excuse to work on the turn taking and fair play. You are welcome Cathy – it is fun to participate as often as I can!